The blockchain universe is evolving very fast. New products and platforms are announced daily. This post should help you to get a rough overview about the existing blockchain technologies. Description Bitcoin is the first blockchain implementation. The network has started in 2009 and the consensus mechanism has not been hacked yet, despite countless attacks. Bitcoin does not support smart contracts like Ethereum do, however, it offers limited scripting possibilities, which haven been applied in various Bitcoin extensions (e.g. Coloured Coins). Very often we hear the criticism about performance of the Bitcoin blockchain, the lightning networks shows a possible solution. In any case, everyone new to blockchain should put his hands on bitcoin and try it at least. The book of Andreas Antonopoulos gives a good introduction to it. Description The ripple concept is based on IOUs and trust relations between network participants. 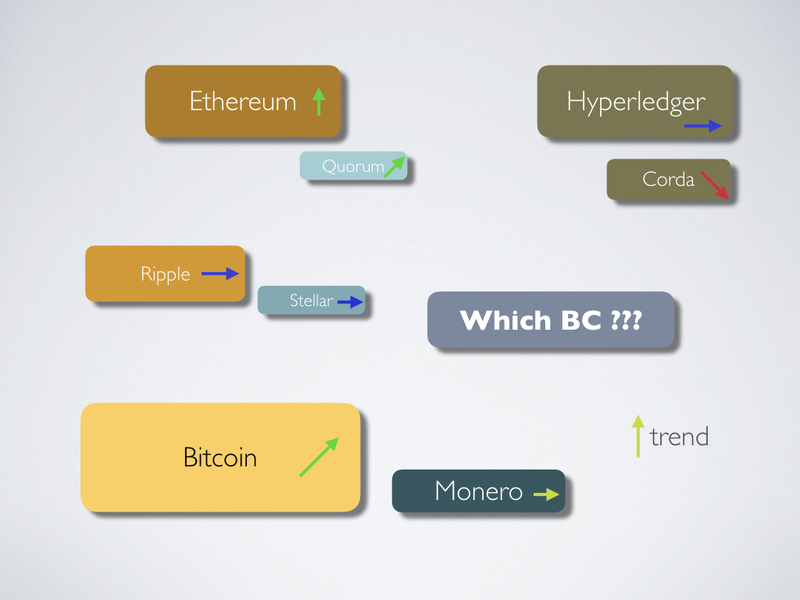 For instance, if a person B trusts that a person A will pay his debts, and C trusts that B will be paying his debts, A will be able to send money to C by introducing following debts (IOUs): 1) A owes money to B, 2) B owes money to C. The network is only managing the ledger of IOUs, the concrete payment is done outside of the network. Moreover, Ripple offers a FX market for transferring between currencies. The FX is offered directly by Ripple. The idea of the systems is, to always use the cheapest liquidity provider. Ripple is used by several banks as an alternative for the classic correspondent bank based international money transfer. The implementations I looked at still look experimental. Description Ethereum is the leading smart contract platform with a turing completed virtual machine. This means that you can implement every kind of algorithm in this smart contract. If you hear the first time about smart contract concepts, it's a little bit complicated to understand the universal power of this kind of tool. The members of the foundation call it the “world computer”. If you think of the bitcoin blockchain as a large distributed Excel spread sheet, Ethereum would be like having the ability to script every single cell of your spread sheet. Disadvantage of this flexibility is that Ethereum has a large attack surface as we already experienced by recent attack. The good news is that the consensus algorithm didn't fail yet at any point in time. It is not recommended to implement complex algorithms in Ethereum. Every execution step costs a predefined amount of gas and is much more expensive than the cost of your own CPU at home. It is easy to prototype your own ideas with Ethereum. Description Hyperledger is not a public Blockchain like Ethereum or Bitcoin, it is more an blockchain building kit under the roof of the linux foundation. The focus of this tool box is building business blockchain apps in private networks. The most active participant seems to be the IBM, they offer also a lot of useful services and extensions around Hyperledger. The IBM bluemix cloud services offers a low entrance level to the technology. The tool box concepts makes it little bit complicated to define the main characteristics of hyperledger, because you can implement a lot of different kind of distributed ledgers or blockchains. Description Stellar started as a fork of the ripple network. If you look from a distance to both networks you see parallels in the functionality and features. The participance of the stellar network should be individuals, ripple focuses on institutional partners. The consensus algorithm was also changed in the stellar implementation. Stellar could also become a SWIFT competitor like ripple. Description Quorum is the shooting star of the last months. JPM extended Ethereum with privacy and a voting consensus mechanism. These two extensions match the requirements in the financial industry pretty well. I am excited to see what will happened with this technology in the next months. Most probably, JPM will come up with new business applications and processes based on their new platform. Description Corda is not really a blockchain it is a distributed ledger system. It comes from the R3 consortiums. R3 started noisy, now first members already left the group. Corda moved under the hyperledger project umbrella, at the moment Hyperledger and Corda are not technical connected, some function exists in both tool boxes in different implementations. The focus of corda is to become a distributed backend database for the banking industry. Today in the institutes you find different IT systems which are loose coupled by enterprise bus systems. The vision of Corda is, to bring this systems to the same distributed database. From my point of view it is a nice vision from a childlike architecture view, but it will not be realistic. I think the technology can be used to realize a new class of distributed backend systems, like distributed Master Data Management or distributed Business Process Management systems in decentral organized enterprise structures. Description Monero's focus is on exchanging the Monero coin. The anonymization level is much higher the in the most other crypto currencies. This could also be useful for legal usage. The ideas behind this crypto are similar to bitcoin, but it’s completely new coded. Monero uses an own protocol which is different to all other blockchain implementations. It’s also not possible to see inside the blockchain without the private key or a special view key. This feature enables also an absolutely private communication between the participants. The transactions will also be splintered and merged, so it is not possible to reproduce a single transaction again. In general, blockchain is a new technology, using it will feel experimental. You’ll have all problems you can get with new technologies in early stages. In this post we have not discussed all the tokens based of Ethereum. This would be a good content for a follow-up article.